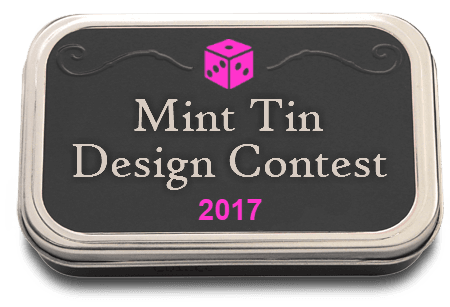 Welcome to the third annual Mint Tin Design Contest. All contest information will be posted in this thread. This is a friendly contest so please have fun and help other designers with their games! 1. There are no restrictions on theme, mechanics, components, or artwork. 2. Copyright rules shall be respected. 3. Entries must have reasonable proof that they will fit into a mint tin. 4. The tin may also be used as part of the design. 1. Team design work is allowed for this contest. 2. Designers may submit up to 2 games to the contest. 3. Games must be available as free PNPs during the contest. Please try to contribute to at least 3 other designs by the time of the submission deadline. Examples of contribution include: playtesting other games, reviewing rulebooks, providing detailed feedback and feedback on graphical design and layout. If you have the time, please feel free to contribute to more than 3. Providing good feedback is an important aspect of this contest and helps other designers. 1. Create a Work-in-Progress or WIP thread here. 3. Post a link to your WIP thread here in the contest thread or send me a message so I can include it in the Entries list below. 4. By the Submission Deadline, all entry files must be marked as "Contest Ready". These files should not be modified during the duration of the voting period. 5. Include the current status of your game in the WIP Thread's title. All registered BGG members are encouraged to vote. 1st place votes receive 3 points, 2nd place votes receive 2 points, and 3rd place votes receive 1 point. All GeekGold tipped to the posts below will be applied to the appropriate prize categories and distributed to the top 3 entries in each category after the contest ends. I will contribute a total of 700 . Have fun and help others! Overview: A simple, short and fun game pitting hardy streetfighters against each other in a fight to the last men standing. Overview: Hurray, your company just got a lucrative job: build a road between two cities. But the computer managing the production line just went bananas and random building material comes out of the factory. Do you give up? Well, partly. Forget about joining the two cities with a wonderful infrastructure, just try to use the material as it is ready and build as much as you can! Overview: A worker placement/set collection card game about mining gold during the American Gold Rush. Fools and Prospectors supports 1-2 players, age 8+, and plays in about 10-15 minutes. Put your miners to work in the gold mines. Get as much gold as possible, but watch out – make sure you aren’t wasting time collecting Fools Gold! Overview: Sly is a solitaire puzzle game with a 2 player variant, for ages 10+, which generally plays in about 20 minutes. In Sly, Jack Sly, the world’s greatest diamond thief, must navigate his way to the diamonds, keep himself out of prison, and ultimately make his escape without a trace. Overview: Old and new heroes join together to save the city of New Meepleton from a new sinister alien army. Created from 2 small decks, Action Cards are paired with hidden Peril Cards. Choose wisely to help your heroes conquer this new threat and save their city. Overview: The BIG Match in a TINY Tin! Using a unique take on the D100 system (2 x D10), this is a 2-player card and dice game recreating the flow and pace of a football/soccer match between two teams. Overview: Play to get the treasure! Overview: In Barbers!, you and a partner face the Sunday rush as new barbers - giving customers all the cuts and shaves they need while preventing the pesky old barber of the neighbourhood from stealing customers from right under your nose! Overview: Fall is ending and for wild geese it means the only thing - to go on a journey to the south, where they'll spend the winter. The path is quite challenging though and not every goose makes it. Which flock will survive? In To the South every player takes control over very own flock of a wild geese. By clever using the dice you try to manage your flock as well as make the journey harder for other flocks, so yours ends the best. Overview: Spectrum Connection is an abstract, simultaneous action card game for 2-4 players. Overview: To win the Nobel Prize for Science you need Credits (VPs). To gain credits you need to complete your research before your rivals. Doing it all yourself is hard and you’ll have to collaborate and therefore share credits at some point, but who with? Don’t want to share the Credits? Then take a chance and swoop in to complete your opponent’s research when they struggle to find a collaborator. Keep an eye on your rival’s research for opportunities to muscle in and share their credits before another scientist beats you to it. Overview: Dice rolling treasure hunting card game. To win, must get in and out of a ruin comprised of 9 chamber cards and 1 treasure card without your health hitting 0. Overview: Chlamys is a small mermaid who has to retrieve her friend Ostrica from the maze of Shell City... but the crabs are on guard to prevent everyone from entering or exiting... will Chlamys succeed in his mission? Overview: This is a dice-placement game inspired by Roll Through The Ages, Advanced Civilization, and Sharp Shooters! Up to four players have 6 turns (30-45 minutes) to build their City-State's military, civics, inventions, philosophies, and government to gain a cultural victory. Overview: Become the 'Prison Boss' by controlling the Yard. Bribe the guards, train your gang of 'Tinmates', and attack other gangs to win the game. Overview: S.O.A.P. at its' core is a deck building game where opponents attack each other's troops on a customizable hex based battlefield with their personal upgrade-able deck of arsenal cards. The basic game type of S.O.A.P. is akin to a straight up arena style death match where combatants fight to the last player left standing. Overview: Exploding Dice is a puzzle dice game where players roll and slide dices in a grid. The goal is to score as much as possible the dices of your color. Overview: A 10 minute strategy game for 2 players. Based on Édouard Lucas’s puzzle, the Tower of Hanoi, players must compete to move a three piece tower into their opponent’s territory. Overview: Farmintin' is a 2 player game focusing on microbreweries that compete to grow their own barley and hops, brew their beer, and distribute it to the local watering holes. Mechanics will include set collection and simultaneous action selection. Overview: In Bookworms, players create paths of letters for their bookworms to travel down in order to make new words. Points are scored based on the length of the word made as well as the dominant color used in the word path. As words are made, bookworm pawns move along the word path so careful planning is needed to make sure that a new word can be formed from where you left off. Overview: This is a game I started to design few weeks ago when, after downloading Deep Space D-6 I thought how nice it would be to have a 2 player game inspired by it, after days of development and tests with my son now the game shows much more features the game mechanics changed and has evolved to a dice placement game where "decision making" plays a bigger role, collect Deuterium and use it to build Starships, Enhancements and Technology Advances. Your starships may perform Standard Attacks or launch risky Assaults. Overview: How long can you survive the zomby a-pocket-lypse? This is a pretty straight forward solo zomby shooter. Nothing fancy, just lots of dead zombys. Fair warning: I am not an artist of any sort nor a graphic designer or anything. The files will all be Word documents or converted PDF's thereof. Please be kind! I do like this game because there are several built-in options for difficulty levels. Overview: Tour Guide is a light, tile laying game for 1 player. As a tour guide you must map out the city and your route through it, making sure to include all the locations of your Tour's itinerary. Overview: Certain Stars is a light tile-placement and pattern-matching game for 1 or 2 players. While out camping, the kids want to learn the constellations, but you’ve forgotten your star guide. As the stars begin to twinkle, can you point out just enough bogus yet believable sky shapes to keep them entertained? Overview: Pirates didn't always blow up and steal things or even throw people overboard. Most of the time, they sat around drinking and complaining about how they "didn't get their fair share of the booty." But, what most people don't know is, they spent a great deal of time dueling each other in a boontastical game. This game, of course, was Shiver Me Tinbers. This game allows for two players to go head-to-head in controlling a fleet of four different types of ships to protect their islands and attack their opponent's islands. You will use a number of different actions to move, attack, acquire resources, and execute special supports to out maneuver the opposing pirate. The pirate to destroy three of their opponents islands first wins and is declared the pirate lord! Will you conquer your foe or shiver in your tinbers? Overview: Beer is an euro style resource management and worker placement game where the players/brewmeisters are collecting and developing the necessary resources to make and sell beer. Overview: Two unlikely parties have crossed path at the old cemetery, which is rumored to be cursed. On the quest to find lost Book of Power (sounds familiar...), they will fight to the last man standing (yep, know this one) in desperate desire to gain knowledge and power to rule the world… (oh, come on). Overview: Two Houses against each other, one kingdom to conquer! Overview: Elvic is an area-control microgame in which players vie for control of five regions of a fantasy kingdom. Each round they receive a single card and a little information about what other players have and they must decide how to use their card while trying to conserve their precious supply of intrigue tokens and anticipating other player’s plans. Overview: The crowded bar was eerily quiet as inspector Fox arrived at the scene. Death by cocktail: not your usual murder. With so many people there the whole department had been sent to take statements, and everyone wants to get to the best witnesses. The Mint Julep Murder is a deduction game for 2-6 players. You need to find the murderer among dozens of suspects. Players race to find witnesses that will help them narrow the field, but will they get in each other's way? Overview: A 2 player no board game to fit in a mint tin. An engaging chess like game of strategy. Incorporates hand management, tile laying and tile movement. Raises awareness about blood. Overview: Battle of SalaMints is a 2 player game that simulates naval battles of classical antiquity. The objective of the game is to sink or board the enemy capital ship. Overview: Into the Mouth of Hell is a micro-wargame set during the Battle of Balaclava. Imperial Russian forces mean to disrupt the siege on Sevastapol from the combined forces of Britain and France. Personal grievances within British command led to the ill fated charge of the Light Brigade. While Balaclava was a strategic victory for Russia, it became a point of pride and valor for the English back home. Overview: Survive the dangers of the Sea of Monsters to smuggle precious goods into enemy ports and become the most infamous smuggler ever known!! The first smuggler to get to 12+1 points (26 for 4 players co-op) will win the game. Smuggler’s End is a competitive game for 2 and 4 players (it can also be played cooperatively in 2v2 mode). Overview: Microbrew is a medium-weight worker placement / puzzle game hybrid for two players. Overview: Flying over the fabled mountain range the Roof of the World, your plane suddenly went down. Luckily, you were on your way to have an expedition in the mountains and your supplies were not ruined in the crash. Unfortunately, you have no idea where you are, or how far it is to civilization. Your expedition has started earlier than expected! Overview: Cryptographer is a game of prediction and out thinking. Players take the role of a code breaker during war time trying to crack the opposing encrypted messages. The first to crack a code might just change the tide of war, but be warned, there is a false code amidst the truth. It would spell disaster if you were to crack the code and uncover lies. Please tip this post to contribute to the Best Overall Design Category. I will contribute 200 GeekGold to this category. Please tip this post to contribute to the Best Theme Category. Please tip this post to contribute to the Best Artwork & Graphic Design Category. Please tip this post to contribute to the Guest Judge Category. This year's Guest Judge is Justin Blaske. 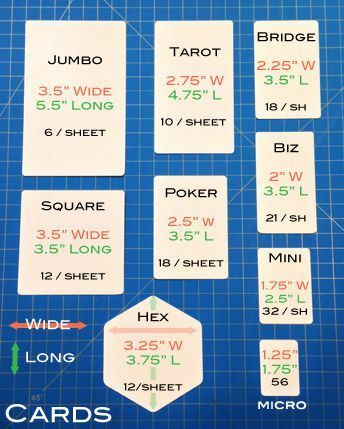 Here is a helpful guide from TGC on card sizes. I believe biz, mini, and micro cards will fit. Very excited for the third year of this contest and for my first time entering a game design contest! I love games that can fit inside mint tins and, thus, in my pocket. My game is Farmintin'. 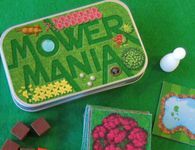 It's about farming, fermenting, and fitting things into a mint tin! It's a 2 player game about micro-brewing with some simultaneous action selecting and set collecting. I'm still working on preliminary game testing, but I hope to have some files up by this time next week. Thank you to R4D6 for putting on the contest again this year! Good luck to all the contestants! I'm looking forward to playing y'all's games! I believe biz, mini, and micro cards will fit. I so hope to create something for this! I even have a super-tiny deck of playing cards that will fit in a mint tin. Now I just need to find the time - but as this runs through November, I'm thinking October will be a good month to set aside for working on a game for this.
" Inner: 2.24" (56.9mm) x 3.6"(91.5mm)"
Hmm, well Yes you are right. You have to have a few slanted. Would I be allowed to submit a game I began designing for another contest but didn't complete? I have one game I made for the 9 card PnP contest but couldn't finish due to the limitations on components, so I'd like to rework the mechanics of the game to fit this contest, if that's allowed. A lot of the other contests require that you never made a WIP thread or anything before the contest start time, but I don't see anything about that here. Yes - Designs that have been withdrawn from other contests are allowed to be entered to this one. Also, designs from the 24h contest are allowed to be entered to encourage designers to continue working on their games. I think that I will give this contest a go this time around. I'm thinking to enter for the first time too! Can anyone tell me roughly how many cards you could fit in a mint tin? We don't seem to have altoids here in Ireland, at least in nonspecialist stores, so I'm kind of grasping at straws for component restrictions. I know that certain games like Mint Tin Aliens have fit up to 64 cards in their tins at the mini size. But it all comes down to the gsm of your cards. I had a similar problem for last year's contest, as I couldn't find any Altoids here in the UK. I ended up ordering some unbranded tins from ebay: Empty Tin Altoids Size - very reasonably priced. Thanks for the advice, I was thinking that mint tins are hard to come by in the UK! Indeed, thanks for the advice! Much appreciated. Is Mint Works the size we're going for? I'm considering entering a game that I previously entered in a 24-hour contest. I will have to work on the components sizes to make sure they fit well into the tin. I'm gonna go ahead and enter Fools and Prospectors as Idea Phase. Thanks! I would think so, yes - especially since Mint Works was initially developed for the 2015 Mint Tin Competition (see link in OP) and then moved to Kickstarter from there.